U.S. 90% silver coins, consisting of dimes, quarters and half dollars minted in 1964 and earlier are currently the hottest commodity in the silver coin market. 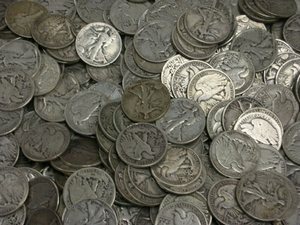 Commonly referred to as “junk silver” coins, historically, these coins have been bought and sold primarily for their silver content. However, since silver prices are currently depressed (having dropped nearly 50% over the past year), demand for these coins is near an all-time high, which has been driving premiums near record levels. The coin dealer wholesale market is seeing these coins trade at premiums in the 12% - 15% range, with asking prices in the retail market as high as 30% over melt value. While all three denomination coins are currently in high demand, investors, in particular, are clamoring over 90% silver half dollars. Coin dealers are typically willing to pay an additional 3% - 5% premium for these coins, as there’s no shortage of interest for these coins. Of the 90% half dollars that are typically categorized as “junk silver coins,” Walking Liberty half dollars are in the greatest demand. Higher end versions of these coins are selling for as much as 50% over the melt value of the coins. With premiums as high as they are, the case can be made to wait until the market stabilizes before purchasing them; however, the market will likely only stabilize once we begin to see higher spot prices. When this occurs, premiums will begin to drop, but will they drop enough so that the coins can be purchased at lower prices than today? This is unlikely, especially since the price of silver is near a three year low, so it appears as though silver remains a wise investment while prices remain depressed. Some experts believe that silver has bottomed, and is poised for a run up to $60 an ounce, but only time will tell. If silver coin and bullion investors are hesitant to pay near record premiums, do they have any other reasonably priced silver options in today’s market? Surprisingly, premiums for American silver eagles have dropped over the past few months, and while the percentage over spot has increased, the nominal dollar amount of $3.50 to $4.50 over spot is now being seen again in the marketplace. This compares to premiums for silver eagles in the $6 to $8 range just a couple of months back. Most other fine silver offerings can be purchased at reasonable premiums; typically in the $2 to $3 range, with premiums on the higher end of the scale for name brand silver bullion, such as Johnson Matthey and Engelhard. In summary, demand for 90% silver coins continues to outstrip supply, resulting in higher than normal premiums. However, since the price of silver is near a three year low and premiums will likely only subside as the price of silver goes up, the case can be made to acquire them at their current levels. On the other hand, premiums for other silver bullion offerings are near their historical average, so the cost conscious silver coin investor may want to explore some other lower premium offerings available in the marketplace.